Rise is FREE on Amazon, Kobo and Barnes and Noble! Yuki and Tanaka have been friends for as long as they can remember, but lately deeper feelings have been bubbling under the surface. How do they navigate the transition from friendship to true love without destroying the powerful bond between them? It’s no secret that I’m a big fan of the Paper Gods series, a dark paranormal trilogy set in modern Japan. I devoured the first two novels (you can read my review of book two, Rain, here), and the prequel novella, Shadow.When I found out about Rise, I may or may not have squealed in undignified delight. What’s better than a novella about two of my favorite characters to tide me over until the release of the final book? A free novella about two of my favorite characters! 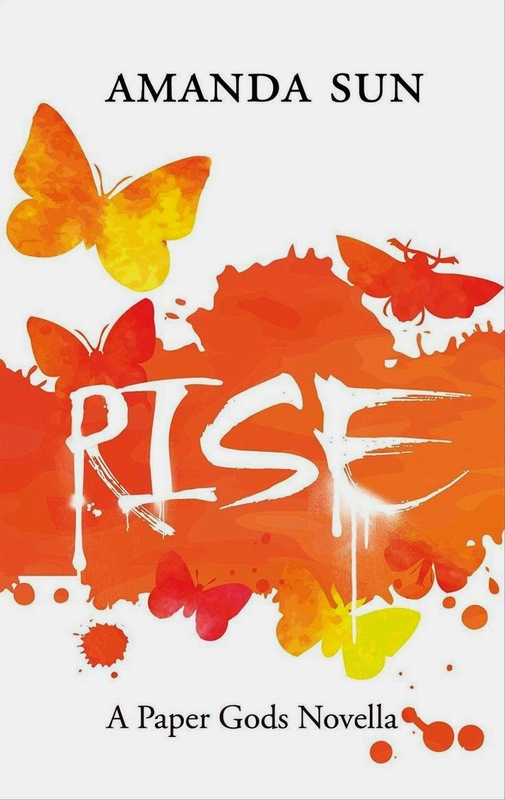 Rise is actually two stories in one, woven together, alternating between chapters. Half the novella tells of the tragic romance of Izanagi and Izanami, as well as the origin of the ink. The other half is the modern story of Yuki and Tanaka. That’s the part I was really excited to read. One of my favorite elements of the Paper Gods is the well-developed cast of secondary characters. Too often, secondary characters seem more like props than real people, placed strategically in the narrative to help or hinder the heroes at the appropriate moment. Best-friend characters, especially, seem to have nothing to do but lie around and wait for the protagonist to call. In the Paper Gods series, however, I really get the sense that the secondary characters have rich inner lives. If you just turned the camera on them, you’d find that they have their own stories to tell and their own problems to navigate, even if those problems aren’t supernatural (at least, not yet). Amanda Sun takes care to include the little details that go a long way toward building a well-rounded character—like how Tanaka practices calligraphy and plays baseball, and how his favorite American TV series is Lost. Except in Rise, we do! In this novella, the camera focuses on Yuki and Tanaka, and their awkward, adorable budding romance. The tension between them has been building steadily for two books now, and it was great to see all those shy glances and blushes finally come to fruition. Their story is more than just romance, however: The modern-day chapters of Risetake place just after the end of Rain, and bridges some of the gap between Rain and the upcoming final book, Storm. For the first time, Yuki and Tanaka have a brush with the Kami. What’s more, the Kami are getting bolder, leaving menacing graffiti in public places… and adding to their body count. Something big is about to happen, I just know it—but I won’t find out just what until Storm comes out this summer. I actually had to read Rise twice. The first time, I was so impatient to get to the parts about Yuki and Tanaka that I cheated a bit and skimmed the Izanami and Izanagi parts. (I know, I know, I’m bad! I just really love Tanaka, okay?) As soon as I was finished, though, I went back to the beginning and read the whole novella again, this time savoring the Kami chapters as much as the chapters about Yuki and Tanaka. I don’t want to reveal too much about the Kami chapters, but I will say this: They’re dark, they’re fascinating, and they enrich the world of the Paper Gods. We finally learn about the origin of the Kami and the ink—and we even get glimpses of a few Kami who will be very, very important to Katie and Tomo’s story. If you’re already a fan of the Paper Gods, then Rise is essential reading. On top of that, it’s free, so you’ve really got nothing to lose and a whole lot to gain. If you haven’t started reading the Paper Gods series yet—what are you waiting for? This is one of my favorite paranormal series of the last few years; I really can’t recommend it enough. You’ve got two months to catch up before Stormcomes out on June 30, so get cracking!